It’s almost time for the coolest (and yummiest) mathematical day of the year – Pi Day, March 14th (3.14). We are excited to once again celebrate P-i Day with P-i-e! All 16 of our GT Pie Co shops are offering a free slice of Michigan ABC Pie with any purchase all day on Wednesday, March 14th. The most excellent part of all? The apples, blueberries, and cherries in our ABC Pie are all from Michigan. We are honored to shine a light both on the quality of Michigan’s agricultural bounty and the importance education plays within our state. What is Pi? The symbol used by mathematicians to represent the ratio of a circle’s circumference to its diameter is the Greek letter π. That letter (and therefore the number π itself) can be denoted by the Latin word pi. In English, π is pronounced as “pie” of course. The number π is a mathematical constant that is the ratio of a circle’s circumference to its diameter and is approximately equal to 3.14159. At Grand Traverse Pie Company, our commitment is to make amazing pie with purpose. We are passionate about making a heartfelt positive impact on those we serve. Make plans to join all of our positive, good-hearted people on Wednesday, March 14th at any GT Pie Co. location. We hope you enjoy what we love to do most – serve handmade pie made from scratch every day, just for you! Will you be sponsoring a video contest again this year? If so, where and when can we find out the details? Hi Steven, we will not be holding our Pi video contest this year but stop in and celebrate with us on 3.14! Is this free slice of pie (with additional purchase) offer good for any customer or do you have to be a member of Pie Dough Club? What qualifies as a purchase? I’d like to bring a few of my middle school students on Wednesday. Would each of them purchasing a drink get them a free piece of pie? Hi Jennifer, what a fun idea! Yes, if each of your students purchases a drink then they will qualify for a free slice of Michigan ABC Pie. We look forward to seeing you on Wednesday! Is there a time? Can I get a piece at breakfast time? Hi Alice, you can stop in anytime on Wednesday, breakfast included! Will you have gluten free pie available for the free slice of pie today? What happened to “just stop by and get a free pie”? Now we have to buy something!? Kinda takes the fun out of it, don’t you think? Thank you for your feedback, Kris. You can purchase any item including a drink or a cup of coffee in order to receive a free slice. 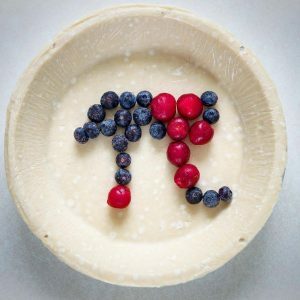 Do you have any Pi day specials/discounts on whole pies? Am I eligible with a phoned-in takeout order? Do you take reservations or are they needed? Seems like it will be a busy day. Hello! Am I able to purchase 2 separate orders and get 2 slices of pie to go? My husband and I wanted to take it home and I would be picking it up while he’s at work.